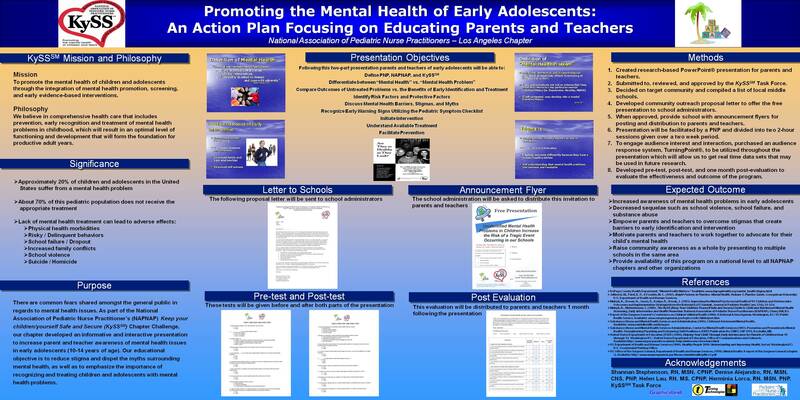 As part of NAPNAP's KYSS Chapter Challenge (2008/2009) our then Legislative Chair and President Elect, Shannan Stephenson, created a presentation about mental health awareness to be given to middle school parents. The goal was to find a middle school willing to host the presentation, which became quite a mission in itself. Our Community Outreach Chair at the time, Helen Lau, sent proposal letters to multiple middle schools in our area, and at last we succeeded! Our first KYSS presentation was held at Peary Middle School on Saturday March 13th, 2010. The original presentation has since been modified and now focuses on the healthy development of "tweenagers", although some parts of the original presentation have been preserved. Peary Middle School invited LA-NAPNAP to repeat the presentation, which was offered again on multiple occasions, and eventually at other locations throughout the LAUSD. Along with the presentation, parents are offered a Q&A session and multiple resources on topics related to "tweenage" mental health. This is just one example of our Chapter's community outreach efforts! For a list of mental health resources, click here.